Life has many transitions…births, deaths, marriages, children, empty nest, and the list goes on. While these transitions are normal and expected, there are other transitions that are unplanned and more of a surprise, such as the loss of a job, unexpected moves, or trauma/tragedy. Transitions can be stressful for any individual. 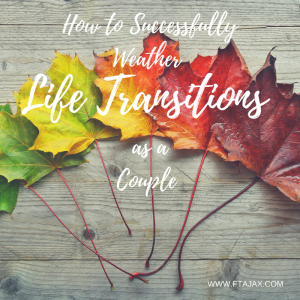 However, going through transitions and adjustments as a married couple can cause additional turmoil and hardship, as there are two sets of opinions, emotions, and experiences involved, and each may need support in different ways. It is important to understand how to work together, turn toward each other and maintain your relationship in the midst of times of crisis. Circle the wagons – Anytime a situation arises, it is important to face this new transition as a team and make decisions together to get through these trying times. During transition points, you may get quite a bit of well-meaning advice on what you should be doing to respond, heal or move forward through the transition. However, be careful to talk with your partner about what the two of you wish to happen during this time. Resist making unilateral decisions in an effort to protect your partnership. Make an action plan – If the transition is expected (i.e., your child leaving for college and you being an empty-nester couple), engage in regular conversations prior to the event. If it’s an unexpected event, have conversations during or immediately after the event. Both partners should work together to develop a game plan for what you can and cannot control. Decide how the two of you are going to work through this situation, what you each need and expect from your partner, and what the new normal can look like for the two of you. Whether this means an overhaul of the budget to pay for college, a change in scheduling or juggling of household roles, go ahead and decide who is doing what, when, where and how. Sometimes a clear plan and some preparation, or in other words, taking control of what you can, will help with anxiety over the things you simply cannot control. Keep the lines open – Even though it may be tempting to put your head down and get to work on your tasks, do not over-look the emotional experience both you and your partner are going through. Intentionally set aside time to check in with your partner daily. Make time for date nights so you can spend some time having fun together. Remember that date night does not have to be fancy or expensive – just set aside time for you and your partner to spend quality time enjoying each other’s company. Seek help – At times like these, lean into your support network of your family, friends, church, peers, and other couples. Many couples have experienced the very thing you and your partner are going through. However, if you find that you are struggling to maintain your relationship during one of life’s unexpected transitions do not hesitate to reach out for professional help. We specialize in helping people with their relationships, especially in times of trials. Contact us today to get on the path to a better relationship.